from Southern Biscuits, pp. 56-57. When Nathalie Dupree and Cynathia Graubart come to town, suddenly good food pops up everywhere. My friend and neighbor, Elaine Corn, a NPR food reporter, threw a book launch party for Dupree and Graubart’s magisterial new volume, Mastering the Art of Southern Cooking, across the street from me. The hostess was Allison Coudert, who put the ladies in her two spare bedrooms, hired Roxanne O’Brien and her students to cater, stocked the house with wine and champagne, and opened the doors to nearly fifty food lovers here in Sacramento. Lots of restaurant folk turned out. As usual, Roxanne’s food nearly stole the show. A book launch party from 4 to 7 pm turned into a lively, flat-out party until midnight. No one wanted to leave. Nathalie and Cynthia were gracious, good sports, who must have been far more tired than they looked. Their energy did not flag. Next day, after the ladies flew off to another city on their book tour, I started to think about biscuits. I wondered if I had ever had a light biscuit. I couldn’t be sure. I’ve choked on so many. So, I plopped on the couch and read Southern Biscuits. The tricks, I learned, involve using self-rising flour (light, low-protein), a wooden bowl wider than it was deep, flavorful fat, and a willingness to get my hands sticky, messy, and busy. The results were worth it. Now I now what a light biscuit tastes like. And I also learned that biscuits should be as easy and fast as no-knead bread. You should be able to throw biscuits together in a snap. However, this is a deep book. Lots to work on. The variety of biscuit recipes and uses is astonishing. But this is a well-written recipe. What I experienced fell right in line with their directions. Shadowcook: King Arthur makes an organic self-rising flour that has less protein (the key to lightness) than the White Lily brand most commonly used in the south. Shadowcook: I used 1/4 cup of lard and a 1/4 cup of butter. The fat ratio is one feature of this recipe that demands experimentation. Fork sift or whisk 2 cups of flour in a large bowl, preferably wider than it is deep, and set aside the remaining 1/4 cup. Scatter the 1/4-inch-size pieces of chilled fat over the flour and work in by rubbing fingers with the fat and flour as if snapping thumb and fingers together (or use two forks or knives, or a pastry cutter) until the mixture looks like well-crumbled feta cheese. Shadowcook: Oh, go on. Get your hands doughy. You know you want to. Work quickly, so just stick your hands in there. Scatter the 1/2-inch-size pieces of chilled fat over the flour mixture and continue snapping thumb and fingers together until no pieces remain larger than a pea. Shake the bowl occasionally to allow the larger pieces of fat to bounce to the top of the flour, revealing the largest lumps that still need rubbing. If this method took longer than 5 minutes [Shadowcook: and it will…], place the bowl in the refrigerator for 5 minutes to rechill the fat. Make a deep hollow in the center of the flour with the back of your hand. Pour 3/4 cup of the milk into the hollow, reserving 1/4 cup milk, and stir with a rubber spatula or large metal spoon, using broad circular strokes to quickly pull the flour into the milk. Mix just until the dry ingredients are moistened and the sticky dough begins to pull away from the sides of the bowl. If there is some flour remaining on the bottom and sides of the bowl, stir in 1 to 4 tablespoons of reserved milk, just enough to incorporate the remaining flour into the shaggy wettish dough. If the dough is too wet, use more flour when shaping. Shadowcook: At this point, I noticed that the dough looked very shaggy, pretty wet, and rather on the unincorporated side. I decided to give them the benefit of the doubt and wrap up the gathering process quickly. Glad I trusted them. Lightly sprinkle a board or other clean surface using some of the reserved flour. turn the dough out onto the board and sprinkle the top lightly with flour. With floured hands, fold the dough in half, and pat dough out into a 1/3- to 1/2-inch thick round, using a little additional flour only if needed. Flour again if necessary, and fold the dough in half a second time. If the dough is still clumpy, pat and fold a third time. Pat dough out into a 1/2-inch thick round for a normal biscuit, 3/4-inch thick for a tall biscuit, and 1-inch thick for a giant biscuit. Brush off any visible flour from the top. for each biscuit, dip a 2 1/2-inch biscuit cutter into the reserved flour and cut out the biscuits, starting at the outside edge and cutting very close together, being careful not to twist the cutter. Shadowcook: I used a 1 3/4-inch round cutter and cut out nearly 24 biscuits. Using a metal spatula if necessary, move the biscuits to the pan or baking sheet. Bake the biscuits on the top rack of the oven for a total of 10 to 14 minutes until light golden brown. Shadowcook: My oven required a total of 16 mins. You have to know your oven. Watch the biscuits carefully the first time. After 6 minutes, rotate the pan in the oven so that the front of the pan is now turned to the back, and check to see if the bottoms are browning too quickly. If so, slide another baking pan underneath the add insulation and retard browning. Continue baking another 4 to 8 minutes until the biscuits are light golden brown. When the biscuits are done, remove from the oevn and lightly brush the tops with butter. Turn the biscuits out upside down on a plate to cool slightly. Serve hot, right side up. 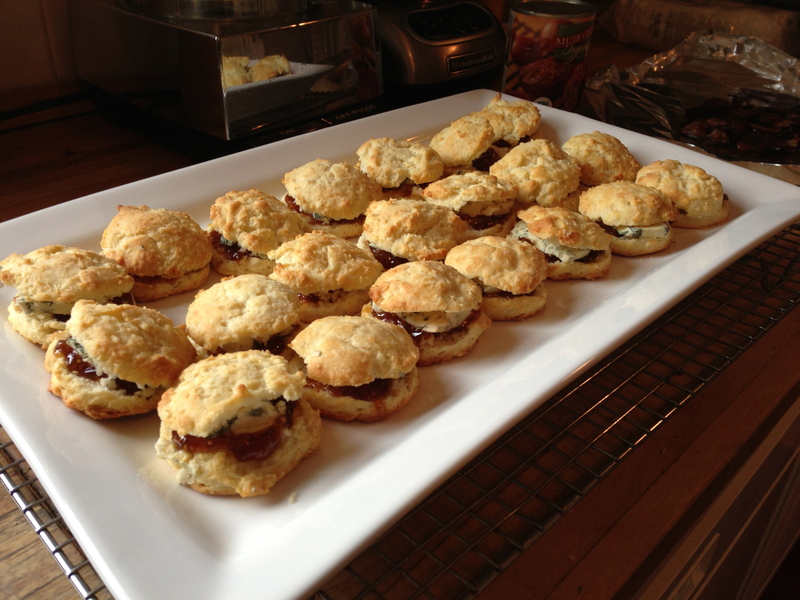 I decided to use my first batch of biscuits as the base of a savory hors d’oeuvres. I bought really really good fig jam and a chunk of blue d’Avergne, split the biscuits open, and slathered on the jam and cheese. When I get to the party, I intend to ask Roxanne what I could have added to give it a little cool crunch. Candied pecan? Something green? Got any ideas? You experienced a biscuit-making learning curve as if you’d been at the demo Nathalie & Cynthia presented at ARC. The crowd watched Reverence was in the air, the crowd watched in hushed reverence. Your sticky mass (mess) was exactly as theirs. 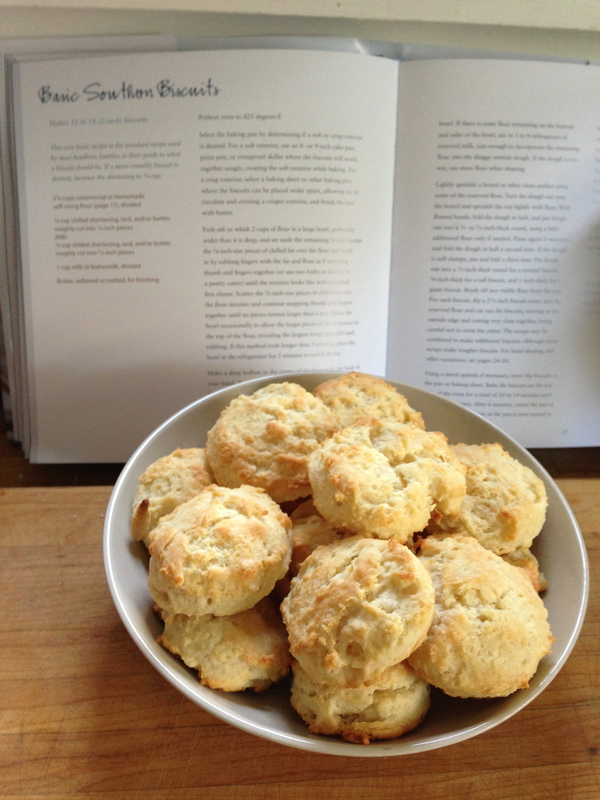 A light touch with hands, the careful folding which causes the biscuits to bake up in flaky layers, you got it all from the written recipe as if the authors had been in your house. And what an awesome response to these biscuits at the party later that night. My name is Emelie and I have read your blog and I really liked your recipes! I work for a website called myTaste.com and I would love for you to join us! Now this I can live with. You’re at least up front about what you’re doing. I delete 50 comments a day posted by people who are hawking sportswear or Louis Vuitton luggage.